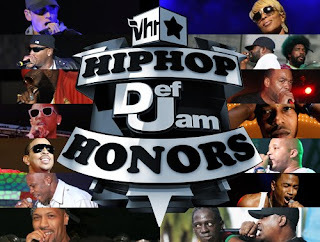 Last night Babe and I were curled up on the couch relaxing when I remembered VH1 Hip Honors was coming on and as it was and ode to Def Jam's 25years I didn't want to miss it! So we tuned in and I have to say they had a wonderful presentation. Tracy Morgan hosted and he was pretty funny, there were interviews with Russel Simmons, Rick Rubin and Lyor Cohen. And of course , the performances were dope! Scarface, Ludacris, Onyx, Redman and Method Man, Mary J. Blige and even Eminem! They had groups and artists coming out the woodwork. I had forgotten how many artists had come out on Def Jam and how many had HUGE hit records! Suddenly there was a stirring in my soul. I was taken back to my youth, remembering the first time I heard RUN DMC "It's Tricky", The Beastie Boy's "License to Ill" , L.L. Cool J. "I need love" and EPMD's "Crossover" and many, many others. It mad me nostalgic for an easier time when life was simpler and music was good. And it made me think how far this thing called "Hip -Hop" or what was considered "rap" music has come. In the span of a couple decades this genre of music has taken the whole world by storm. There is no denying it's influence in music, clothing, speech and culture in general. see how far your dreams can take you?